I love my job, really. To be responsible that every artifact is at the right place, at the right time when it is needed is a wonderful duty, so is the challenge to keep them safe for future generations. However, there’s one thing that bothers me and I know bothers many colleagues in the field of collections care, may they be collections managers, registrars, curators, conservators, documentalists or data base managers. It’s the question “Why does this take so long?” or “Why isn’t that task finished, yet?” It bothers me so much that I swore to myself if I run into a good example, I’ll write a blog post about it. Well, last week was a very good example. One of the very first things I discovered on this early Monday morning was a very heavy box, roughly the size of a shoebox. 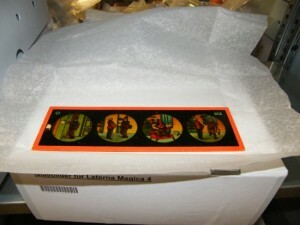 Inside were dozens of glass slides like they were used for a ”Laterna Magica“ or magic lantern back in the 19th century. Some were in their original boxes, some piled on one another without any support. 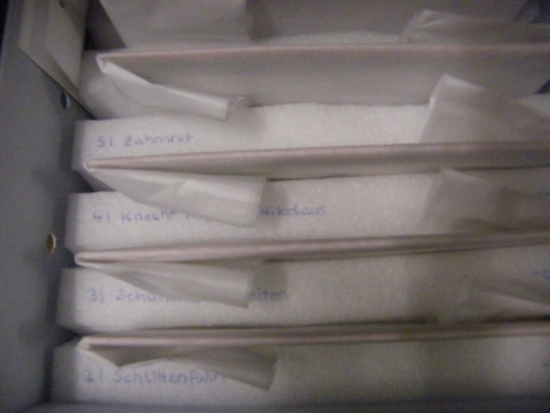 Some of the slides already suffered damage because of the poor storage conditions. Repacking them was inevitable. I spent the rest of my Monday doing some research and inventing a better storage for them. I figured out that wrapping them in acid-free tissue paper was a good start. However, to store them they should have a home where they couldn’t move and get damaged. It should be easy to find the slide one is looking for and take it out without having to touch other slides. 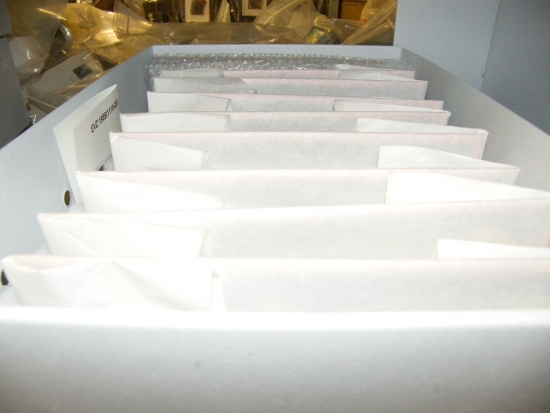 I took an ethafoam block, cut it the size of an archival box and cut into it supports for the slides. That way the slides can be carried around safely, can’t slip inside the box and everyone can find a needed slide fast. I assigned the task of building boxes for the remaining slides to my student assistant on Tuesday. First of all because I had other things to do and secondly because I’m not a good box builder while she does awesome artifact homes (see ”Storage Solutions: A Home for the Barcode Scanner“). I focused on finding a place for the slides. They should find a home where our collection of photography and camera equipment is stored. But, like many other museums, we have space issues. With the new packaging the slides would need the place of six archival boxes which I didn’t have in this row of shelves. Finally I figured out if I repacked the collection of narrow film cameras into archival boxes so I could stack them I could gain about 3 free shelf boards. 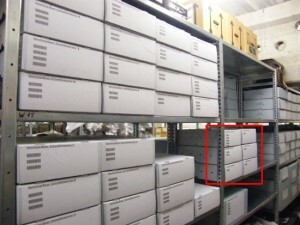 Shelves with repacked narrow film cameras and the six boxes with glass slides (marked red). You can also catch a glimpse of the now empty shelf boards. Well, it’s not as easy as it sounds. We are changing our location tracking system from pure manual to barcoding. To push the project forward we established the policy that every item we have in hand gets its new object label with barcode. This is especially a good policy because many of our old objects labels have polyvinyl chloride sleeves we want to get rid of. I got 118 narrow film cameras to repack, so I printed out 118 new object labels, cut them, folded them and assigned them to their respective camera. Of course, every new archival box needed a label so we know what’s inside. They had to be printed, cut and attached as well. Sitting on another shelf means getting a new location entry in the data base – and of course the archival boxes got new distinct identifiers that needed to be in the data base, too. So, you can easily imagine what I did Tuesday to Friday. Of course I performed some other tasks, too (read Anne T. Lane’s ”Off the Shelf – A Day in the Life of a Collections Manager“ for more) and after the six boxes with glass slides were located I still had two and a half shelf boards of newly created space for the next camera equipment that comes in. 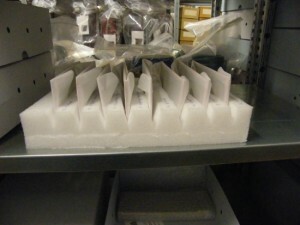 But if you don’t look at the bigger picture you could sum my working week up to: I relocated a box of glass slides. I’ve recently assumed the role of registrar at a small museum, and this article struck a chord/made me laugh. I go through the same thing every day. I’m at a relatively new museum that has collections from a previously dissolved collection. Documentation is a nightmare, so I’ve taken to simply opening boxes and going from there. Some boxes take a manner of minutes, while others are turning into week-long affairs. So, yes, it takes me a week to go through one archival box, but that involves sorting out photos, documents, and 3D artifacts of mixed media, not to mention location and documentation updates (they are never correct) and rehousing. But I love it. I wouldn’t do it otherwise. I broke out laughing when I read the article and comment. It is so true and so frustrating. One thing not mentioned is that the original notation is sometimes incomplete. It may take an hour, a day, or even longer to locate the information and verify it before it can be entered into the computer and added to the original notation. People do wonder why storage takes so long. I wonder how it goes so quickly. It takes so long because there are SO MANY objects to organize! There are so many little details, and the last person who was trying to do it skipped something, or a file is missing, or the phone rang, and I had to drop what I was doing to handle the next perceived emergency. There is no such thing as an easy household – or museum – task. My mother – who as an architect was the handyman in my house growing up – points out that it is impossible to just hang a picture or replace a washer. One thing leads to another and before you know it you have to go to the hardware store – at least twice – to buy a new piece for the toilet. Similarly I find that I can’t just file a document in an accession file or photocopy a record for a researcher. Two hours later, I’ve had to assign five new catalogue numbers and revise twenty computer entries.